You don’t frequently see the term “secret steakhouse” referenced in mainstream media. Yet, little-known Bogie’s Place has generated signifcant buzz since its 2012 opening – averaging at least one article a year in Boston publications. Somehow, despite being perched on the edge of downtown crossing and the theatre district, this hidden gem still stays under the radar, with many self-proclaimed foodies never having heard of it. The restaurant’s small size and steep prices may contribute to the mystique. Bogie’s Place seats 20 on a good day, but this intimate atmosphere is a welcome respite from the manufactured feeling of larger chain restaurants. With Valentine’s Day right around the corner, “intimate” seems the way to go, and I decide to see if this restaurant lives up to its buzz. Entering Bogie’s Place is like going back in time. Diners are ushered through the hubbub of JM Curley to a small room tucked behind the bar, the entrance to which is hidden by a crimson velvet curtain. Inside, more red velvet lines walls lit by flickering sconces. A dark wood bar and matching tables contribute to the noir ambiance. The light grey leather of the booths along the walls offer a visual relief from the atmospheric but dark interior. A charcoal sketch of the restaurant’s namesake lords over room from his position behind the bar. In this setting, I keep expecting to see Lauren Bacall look-alikes, dressed to the nines and swilling martinis while tuxedoed gentlemen offer them a light. Given the atmosphere, I keep hoping for Ella Fitzgerald or ol’ Blue Eyes, but the soundtrack remains a bit jarring as it serenades diners with the more modern strains of James Brown and Cher. While the design oozes nostalgic glamor, the wait staff vibe is relaxed and familiar. Servers are friendly and knowledgeable, but low-key. You won’t find the effusive restraint of other upscale Boston establishments here. This private restaurant is, after all, in the back of a neighborhood bar. The front room, JM Curley is renowned for good food, hard drinks, and a brash, no-nonsense attitude. Bogie’s Place is bit more refined but obviously originating from the same roots. 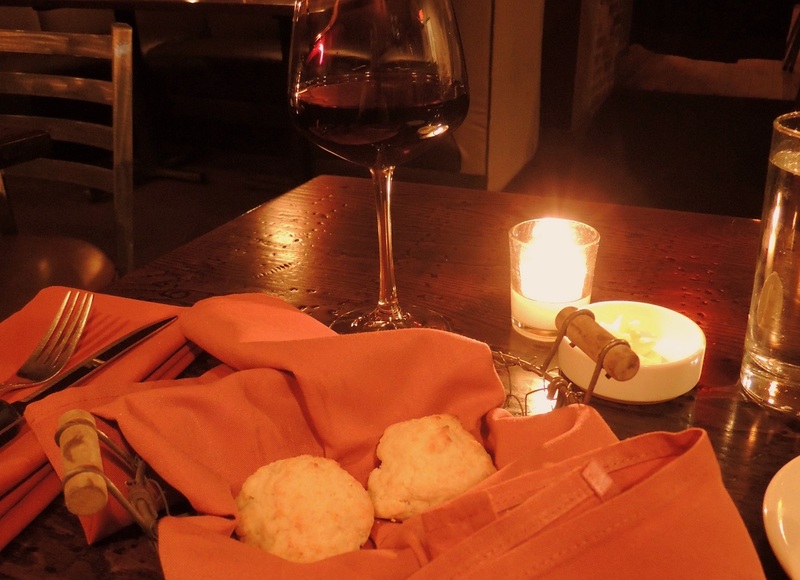 The food is excellent, with a solid wine list and spot-on martinis. Bread service, in the form of exceptional biscuits, kicks off the meal. Warm, flakey, and moist with a crunchy exterior, these biscuits beat a Parker House roll any day of the week. The side of honey-infused butter only adds to the comforting, seductive flavor of these amazing little delicacies. 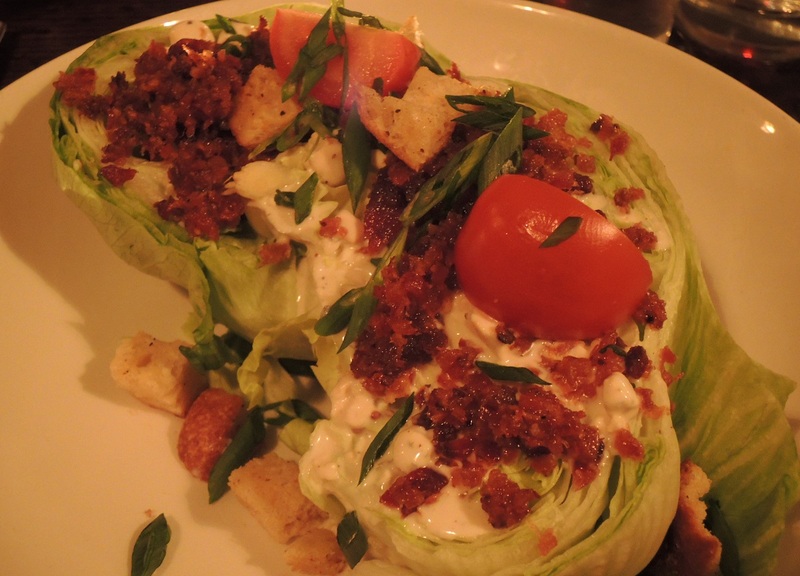 For an appetizer, the wedge salad ($10) is a must – but this enormous dish is best shared. Two large hearts of crisp, fresh iceberg lettuce are topped with salty, decadent bacon; ripe, juicy tomatoes; snappy scallions; and crunchy seasoned croutons. A creamy and piquant blue cheese dressing is very lightly drizzled on top. If, like me, you consume salad dressing by the pint - don’t worry, the servers are happy to bring out extra helpings of that liquid gold upon request. My steak, the nine oz. tenderloin from Maine Family Farms ($45), is one of the better incarnations I’ve had in a while. Tenderloin is a lean cut of meat and can be a bit flavorless if the preparation isn’t inspired. Luckily, my meat is perfectly cooked and juicy with a lovely beefy flavor accentuated by a delicate char. This steak does not need the optional foie gras butter ($6) or roasted bone marrow ($6) toppings – although the house rub for an additional five cents does a wonderful job bringing out the meaty flavor and kicking it up a subtle notch. The side of confit potatoes with bacon, shallots, and cider vinaigrette ($12) is an excellent salty-sweet and slightly acidic compliment to the steak – like an elegant version of Salt & Vinegar chips. 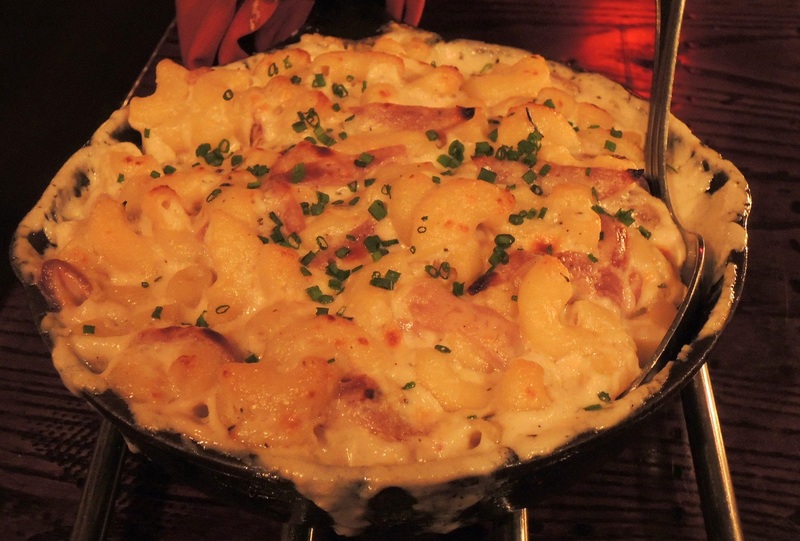 But it’s the mac and cheese, filled with goat cheese and caramelized red onions ($15) that transports me to a rich, sweet, and tangy heaven, taking this meal to an unexpected level of hedonistic delight. Alas, not every side is perfect. The roasted cherry tomatoes ($10), while great in theory, take on an unappealing mushiness when cooked whole. Other than this one shortcoming, the meal is perfect. The recommended wine pairing – a delightful Joseph Carr Cabernet Sauvignon ($16) – is tannic and astringent enough to stand up to the flavorful steak but with enough lush, fruity characteristics to compliment the decadent sides. While you can hardly call dinner an exercise in delayed gratification, dessert might make you reconsider that notion. Thick, warm, and intense molten chocolate cake ($8) is the way to go. The first bite makes me protectively huddle over it, while I consider what I would trade for a lifetime supply. This cake’s crunchy exterior belies its gooey interior bursting with sweet, dark chocolate, while a slightly tart raspberry sauce underneath cuts through the rich flavors. Silky whipped cream on top – with only a hint of vanilla – is a beautiful palette cleanser in between bites. This well-balanced little trifecta of flavors is the perfect way to end an exceptional meal. After signing the bill – hopefully satisfaction-induced haze combats sticker shock – you’re escorted out a private exit, further reinforcing the exclusive air that permeates the experience. Bogie’s Place draws in a crowd of young professionals and hip diners looking for something a little different. Luckily for any suburbanites, the restaurant offers validated parking at the Lafayette Garage a few blocks away, although the Boston Common Garage is cheaper and just as convenient. 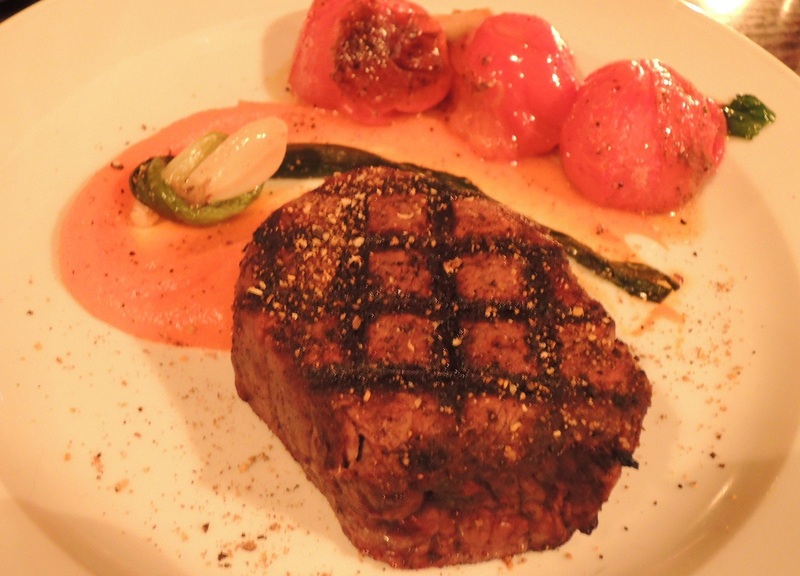 For any diners looking for a killer steakhouse off the beaten path this Valentine’s Day, you can’t do better than Bogie’s Place. Just remember to leave the Louboutins at home. They’re a bit over the top for this sophisticated yet laid-back establishment. Reservations available by phone, email info@bogiesplace.com, or through Open Table.